FOR SALE: Tall ceilings for tall toys!! PAST MODEL CLEARANCE, REDUCED FROM $59,914 TO $47,900! Toy hauler w/2 slideouts! The Stryker is a sleek, stylish and robust toy hauler by Cruiser RV built with a 102" widebody construction. The 10' garage features a rubber floor with heavy duty anchors bolted through a plywood base. When you're not hauling your toys you can throw down the the removable carpet and fold down your benches to have a nice big dining area. At night the benches fold down to a queen bed, with another queen bunk above it. All operated with the push of a button. Keep the back door open all day with the rear screen to keep the bugs out. The living area is complete with a triple recliner couch with heated seats, large kitchen with stainless steel sink and a Kenwood stereo to keep the tunes pumping. The Stryker truely is a striking rig to say the least. At Sun Valley RV, we strive to make you the customer happy. While browsing through new RV's we want you to be comfortable and informed with what you're looking at. After a purchase we want to keep you happy as well. We have a large parts inventory for any accessories you may need. We also have a fully equipped service department. If there are any warranty concerns that need to be addressed, express them to us and we will do our best to resolve any issues. The customer is what keeps us in business and we appreciate everyone! 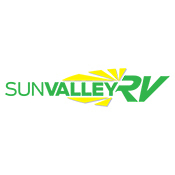 Sun Valley RV is a Manitoba RV dealer and Manitoba's official Winnebago RV dealer. We are also a long time dealer for Triple E and Leisure Travels vans. We are just a short drive from Winnipeg Mb, located on highway 3 between Morden and Winkler. Winnebago has been building top quality motorhomes for half a century, most RV manufacturers can't say that. Leisure Travel Vans have exploded in popularity, and have a huge loyal following of the magnificent little RV's. Let us at Sun Valley RV show you why a Winnebago or Leisure Travel Van should be your next motorhome!